*Student, parent and faculty members represent each of the Academy's three sections: PYP, MYP and DP programmes. The CLT meets regularly to discuss and formulate recommendations for specific projects and initiate actions associated with those tasks. In recent years, the CLT has been asked to facilitate several projects. As a result, the CLT was instrumental in renewing an emphasis on programs originally established as core hallmarks for Westlake Academy and in facilitating the implementation of new initiatives to help create a renewed interest in the House System. The CLT has helped the House System become more visible on campus and has worked to encourage more house-associated activities. On an annual basis, the CLT will elect a Chairperson who is responsible for arranging and conducting CLT meetings, a Vice-Chair who assumes responsibilities of the Chair when the Chair is unavailable, and a Secretary who is responsible for recording and distributing CLT meeting minutes. All CLT members are expected to participate in the flow and exchange of ideas and to contribute to the development of recommendations for Westlake Academy. The blacksmith's anvil is symbolic of strength & stability. Each of the four houses (Keller, Thoreau, Wheatley, & Whitman) may earn the anvil honor based on team competitions & point accumulation. 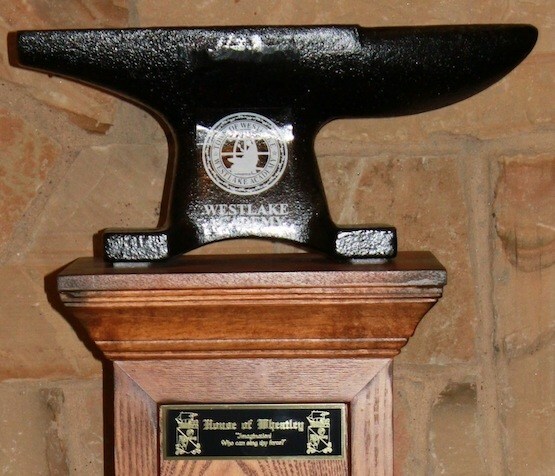 Former CLT Chairman Bert Shultz provided this anvil (pictured here) for the House Award for earning the greatest number of points in a school year.